Here's a small selection of the projects we've been involved with over the years. LCV makes a concerted effort to promote the work of female artists, composers and musicians who are under-represented across the industry. The choir was first founded for a concert with female electronic music pioneer Imogen Heap. We have worked with a huge range of female artists across a range of genres including Charlotte Church, Joss Stone, Laura Mvula, Kim Wilde, Eska, Kate Nash, Susanne Sundfor, Little Mix, JAIN, Lucy Rose, Jesca Hoop, KARYYN, Deepa Nair Rasiya, Maya Youssef and Clare Maguire, as well as providing backing vocalists for Florence and The Machine, Nicole Scherzinger, Alison Moyet, Nina Nesbitt and Liv Dawson. In 2018 we hosted our first concert dedicated solely to the work of female artists and composers, with the majority of music also arranged by female members of London Contemporary Voices. We also invited guest artist and political campaigner Charlotte Church to give speech about women in the music industry. We are planning our next Women In Music concert now. Music for our landmark Queen Elizabeth Hall Southbank Centre concert in November 2018 is by over 50% female arrangers and artists. LCV’s singers come from a variety of musical backgrounds and many are artists and songwriters in their own right. LCV is encouraging and facilitating the writers under its umbrella to create new music, including new choral versions of pieces, to be performed in public. LCV has also subsidised recording costs to create demo materials for artist portfolios and also facilitates industry-facing relationships and contacts. Original music from our writers will be showcased at our Queen Elizabeth Hall Southbank Centre show in November 2018. We are currently setting up writing circles to allow our members to collaborate more easily and generate new music. LCV regularly performs for charity fund-raisers and awareness-raising campaigns. LCV has worked with Warchild UK, CLIC Sargent, Stand Up To Cancer, Pride, National Trust, Oxfam, London Wildlife Trust, CALM, RLSBP, HUBBUB and many more. 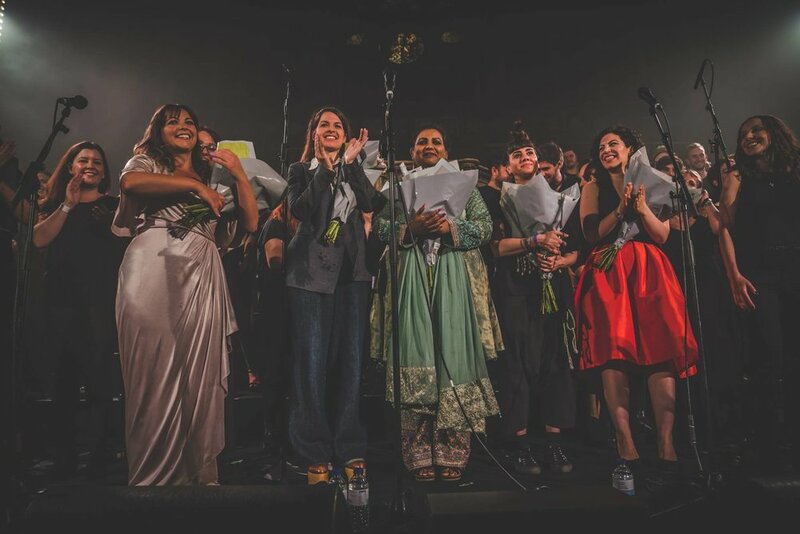 Such collaborations raise vital funds for excellent charitable work and also provide performance opportunities for our singers and reach new audiences (charity performances have involved work with established artists including Sam Smith, James Bay, Marcus Mumford (Mumford & Sons), Imogen Heap, Laura Mvula and Newton Faulkner). PERFORMANCE PLATFORMS FOR LCV ARTISTS, COMPOSERS AND ARRANGERS. Many LCV singers are artists in their own right. LCV regularly provides opportunities for its emerging artists to perform with the choir at large concert venues, attended by press and music industry guests. LCV artists have performed in concerts at Union Chapel, St John-at-Hackney, Omeara, Bush Hall and more. Five LCV artists have been selected for the Glastonbury Emerging Talent longlist following such shows, as well as receiving opportunities via BBC Introducing. Many of our members also arrange music and we provide regular opportunities to showcase work. Our concerts also provide the artists and arrangers with essential video and media content to promote their own projects. LCV supports new music creation and has provided voluntary choirs and backing vocalists for numerous emerging artists who could not otherwise afford to work with a professional choir. LCV worked with band Alt-J in the run-up to their Mercury Music Prize win in 2012, including performances at the prize-winning showcase gig and on BBC2's Later with Jools Holland. Since then the choir has gone on to work with 50+ other acts (including 7 other Mercury nominees). LCV has arranged and performed choral backing for emerging-stage artists including Amber Run, Rhodes, Luke Sital-Singh, Mt. Wolf, Leo Stannard, Palace, Shlomo, Tom Speight, Passport To Stockholm, Rachel Sermanni, Sam Brookes, Hunrosa, Gwilym Gold, Kizzy Crawford, BeatFox, Tina Grace, The Sea & I, RINNGS, Sam Way, DEMS and more. Such opportunities also provide essential experience, CV development and contacts for early-career singers, and opportunities to work in novel ways or with new platforms (such as the binural "headphone session" audio recording with Sam Brookes pictured above and our successful collaboration with band Amber Run for Mahogany which has 4 million hits). Our new series of regular Open Rehearsals offers the chance for members of the public to come and sing with members of London Contemporary Voices. No previous experience is necessary. New research has shown that singing reduces stress and even helps you live longer! It’s also a great way to meet new people. One of the greatest things about LCV is our vibrant community which also acts as a social support network and helps people to feel less isolated in London, particularly for professional musicians who often struggle due to antisocial hours and a lack of regular routine. Through our Open Rehearsals we have extended our network to include friends and followers of the choir - a great way to get involved! See our Facebook site Friends Of LCV for further details. LCV spent a wonderful day on the blustery Kent Downs for The Ash Project, unveiling two stunning sculptures by Ackroyd & Harvey. The UK is expected to lose up to 98% of its Ash trees to Ash Dieback disease - it’s our third most common tree, used by over 900 species! Those species were the inspiration for a soundbath piece created by LCV’s founder Anil Sebastian and sung by LCV’s Sian, Marit, Jeremy, Adelaide and Sam at the launch. Anil took the sound of sap moving beneath ash bark and layered it with animal distress calls and birdsong, manipulating the sounds electronically. There were even bat beats! The scale of the loss we face is huge and these striking new sculptures which highlight the problem can be seen for miles around. Living Words has received Arts Council Funding for a group of singers from LCV to be trained in the specialist methodology and turn some of its poems into original choral music under LCV’s Director Anil Sebastian. Anil and the singers have been working in care homes in Folkestone, Kent to create new works that will be performed at our landmark concert at Southbank Centre in November. Living Words is an art and literature charity established in Folkestone, Kent, in 2007. The organisation conducts residencies in care and nursing homes, community settings, arts centres, day centres, libraries, theatres and hospitals. Living Words writers and artists receive training which allows them to work co-creatively and one-to-one with people experiencing a dementia and isolated and disempowered people; enabling participants’ ‘in-the-moment’ experience to be heard by others. The charity runs bespoke staff workshops to support their creative expression and embed use of the Living Words books. LCV regularly collaborates across a range of art forms, providing the opportunity for other arts disciplines to be seen in a new contexts. Previous collaborators include The Heritage Orchestra, Birmingham Royal Ballet, The Royal Ballet School Young Dancers, Comedians Russell Howard and Jack Whitehall, Cirque Bijou, Docklands Sinfonia, Basement Orchestra, Stompy's Playground Dance Orchestra, BeatFox, Shlomo, Charlotte Church and visual artist Penny Woolcock (Utopia installation, The Roundhouse), plus DJs, drag queens, circus arts, beatboxers, magicians, visual artists and film-makers. LCV regularly performs at Campfire Club in association with The Nest Collective. LCV Choir and LCV artists have featured at these atmospheric gigs, which take place outdoors in natural surroundings across London such as London Wildlife Trust reserves. These intimate gigs reach new audiences and raise awareness of environmental issues/conservation. LCV has been a regular on the UK festival scene for over 7 years, with both staged and pop-up performances, plus accompanying talks and workshops. Often immersive or interactive in nature, the choir's pop-ups have been seen at Secret Garden Party (pictured here in the sunflower field), Wilderness, Camp Bestival (including children's workshop), Bestival (entertainment exchange and talk with beatboxer Reeps One), Standon Calling and Pete The Monkey (France). 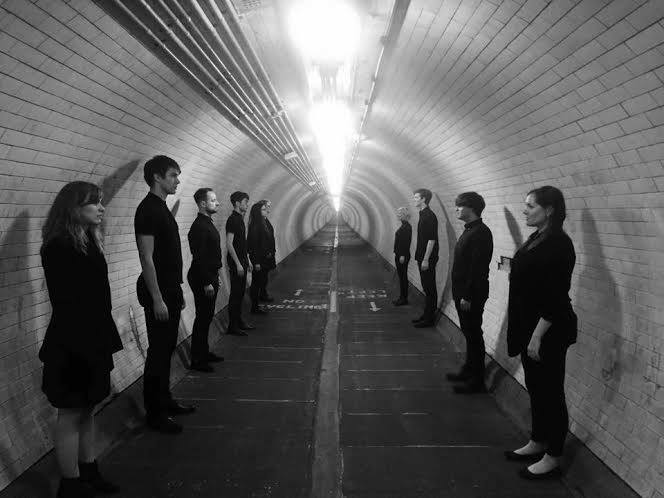 The choir has also appeared with artists at Reading, Latitude, Barn On The Farm, and has appeared at local specialist arts festival festivals such as Tandem Festival (Environmental Arts, Oxford), Profound Sound (Improvisatory Arts, Folkestone), I=U (Sound and Wellbeing, Shoreditch), Chorus Festival (Southbank Centre) and Reverb Festival (The Roundhouse). These performances give our singers the amazing opportunity to perform on large stages in a variety of contexts. First performed at I=U festival of the senses, LCV has developed a unique "Sound Bath" installation which provides a multi-sensory experience through improvised music and words, also involving local music makers. The Sound Bath was most recently performed at Profound Sound Festival in Folkestone (Kent, UK), with lecturer Sam Bailey from Free Range/Canterbury Christ Church University. A growing avenue of exploration, LCV has been applying new technology to choir music. The choir regularly works with electronic artist Cherif Hashizume (Jon Hopkins/Brian Eno/David Byrne) and is exploring machine-learning and AI in relation to choirs. The choir has performed in several light-responsive installations, including Reverb Festival at The Roundhouse. The choir is also working on a top-secret project regarding surround sound performance - details coming soon. A significant number of LCV's singers identify as LGBTTQQIAAP. LCV was founded by gay couple Anil Sebastian and Didier Rochard and aims to provide a welcoming environment for a diverse range of musicians and audience members alike. LCV regularly performs at LGBTTQQIAAP events, including London Pride Festival and also hosts its own inclusive events. The LCV community has been a great way for like-minded LGBTTQQIAAP people to meet each other in London - an underrepresented group in the music industry at all levels.